I can't believe how time flies! It's the second week of The One Room Challenge already. You can read about the first week of The One Room Challenge here. I am getting more and more nervous now because the hardwood floor installation is not completed yet. It's only 80% done now. If it's not done by next weekend, we can't proceed with these steps and we will have no reveal. Just thinking about the worst makes me shivers! You can read all about our hardwood floor drama here. Honestly, I am not a fan of blue before I saw this pillow. I just never find the color blue to be appealing for some reason. (I am weird, I know, don't judge.) But when I saw this pillow at Target for the first time, my heart skipped a little. Because I am not sure if it's a momentarily excitement, I didn't buy this pillow on the spot. But after a few more trips to Target later, my heart still yearned for the same striped navy pillow. Before I bought them, I needed to know where I will be putting them first. My first thought was the master bedroom. I really liked the idea of injecting some blue in my bedroom since all the other areas in my home is blue-free (I wasn't a blue fan before I saw this pillow, remember?) so I thought it will be a refreshing change. So, yes, the above pillow is the starting point and inspiration for my whole bedroom design! After getting the pillows, I found this on West Elm. With my new obsession with all things navy and all things whimsy, I was attracted to this pillow right away. However, like most pillows from West Elm, they are not always cheap. I was not ready to fork out $34 just for the pillow cover and then pay an additional $16 for an insert. So I waited for a sale and fortunately, they had one! I was so thrilled and bought one online! 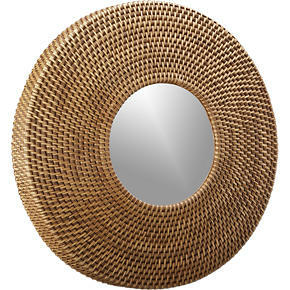 And one day while doing my regular window shopping at Crate & Barrel, I saw the above mirror. It looked fabulous and as a plus, it was on sale, it was really affordable so I bought two. I thought they would really compliment my new pillows. Before I know it, my bedroom was heading to a nautical direction. I didn't plan on it but it just happened. I always love the easy breezy feel of a beach home but I have never thought of doing any kind of "beach-inspired decorating" fearing it might look too "theme-ish". But since I am already headed to this direction, I am planning to add other elements into the bedroom so the overall design doesn't look too expected or contrived. Anyway, I have bought a few expensive items at West Elm prior so I have earned my first $50 design dollars. With the design dollars, I bought the two items above among other things I picked up that day. And speaking of West Elm, the curtains I bought from them earlier wasn't the color I wanted so I went hunting for new ones again. After hunting for days, I found the perfect one. It had the color I wanted and it absolutely fit right into my husband's budget for just $20 per panel. I was about to get other more expensive panels before I found this on clearance! He asked me to order right away before they are gone forever. I ordered them last weekend and they should arrive sometime this week or next week. It's 96" long so I will need to make some adjustments considering I have a 92" tall ceiling on my master bedroom. 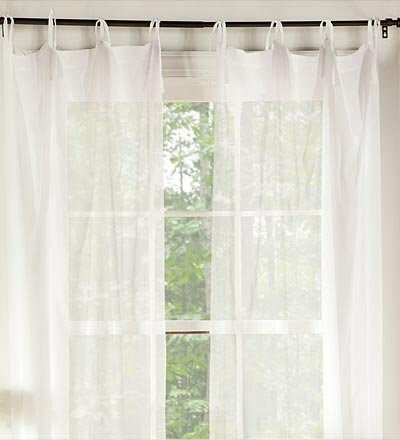 I also ordered these gorgeous white cotton canopy bed curtain panels for my four poster bed yesterday. I hope the length is right. I already had cream colored canopy bed curtains earlier but I am ready to switch to white ones this time with my new all- white bedding. I am so excited I can't wait to decorate this room in the coming weeks! So, what do you think? Do you like the direction I am heading to? I have a few more accessories I bought during sales last year but you will have to wait till the final reveal on week 6 to see how I bring everything together! I hope you enjoyed seeing today's sneak peek of all the pieces I plan to incorporate in the coming weeks! 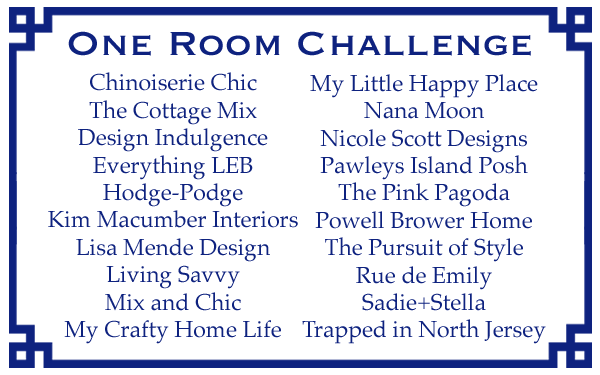 The following are the 20 participants from The One Room Challenge. I hope you will be following me and the rest of these talented ladies as we transform our spaces! Jessie....What great ideas! Blue is IT! I am falling in love with it all over again. I am thinking of adding some blue throw pillows "around". Maybe the blue undertone's of my paint color, Silver Strand, will come through! Getting back to your room. 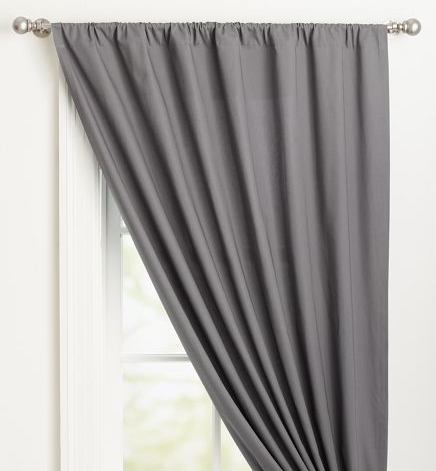 Great buy on those drapery panels. West Elm is amazing. Used to live within 5 miles of one! Your husband will get the floors done to perfection, and in time! Blue and White is so refreshing and glad you are putting in the mix of other finds from WE! Great finds!!! Can't wait to see more! Happy 4th! I am loving the direction and those finds - fabulous! Have fun installing hardwood :) And Happy 4th! I miss living in the US, and you Americans sure know how to party! Great start. Has a very nautical theme happening. Love it! I LOVE the direction -- so crisp and fresh! All of your finds are fantastic, and what a huge bonus that they were on sale! Way to go! What a lucky find on the drapes. Well it sounds like you will have everything ready when the floor gets done. Happy 4th. I love where you are headed with this! I think there are definitely ways to go with the nautical theme without making it too 'theme-ish,' and you are on a great track! Can't wait to see how this all turns out! Happy 4th to you. Love everything you have found so far! Can't wait to see it all come together! Good luck with the floors!! Fingers crossed!!! You've found some really great things. I think this is going to be a wonderful room! It is going to be great! You will see by my home and posts that I love love navy and punches of color. So fun finding the perfect things you love. Blue is a great color and can be mixed with so many colors! you may not have it in your home, but you have it in your header on this blog! Good look. you are well on your way! 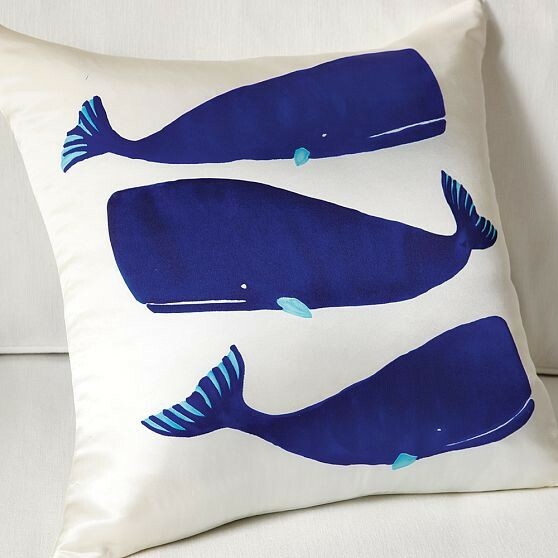 Love blue and oh goodness that whale pillow is so adorable! I love where you're going - can't wait! I can feel your excitement! Ain't it great when a plan comes together from an inspiration piece. Where did you buy the canopy bed panels? They are very romantic. Great finds! Navy and white is one of my favorite color combinations. Looking forward to checking back next week!